There are many plants that boast floral beauty, but to qualify as having unique flowers, a plant must go beyond the call of duty: Its blooms must be unusual in one way or another. In some cases, it will have bicolored flowers; in others, the blooms will be unusually large or oddly shaped. Growing these plants is a wonderful way to set yourself apart from your neighbors. Bird of paradise isn't only bicolored, but also uniquely shaped. 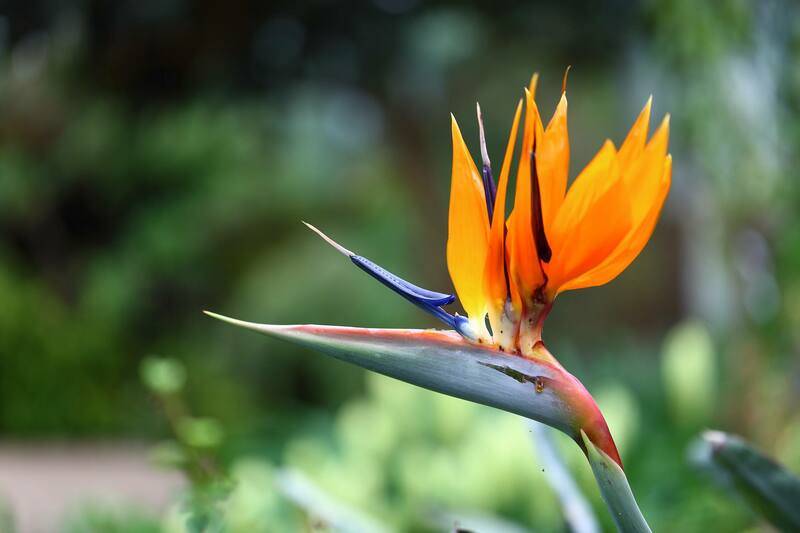 A tropical plant indigenous to South Africa, Strelitzia reginae grows in the jungle, where it can enjoy hot and humid conditions. It's perennial only in USDA plant hardiness zones 9 to 11, so Northerners will have to grow it as an annual. It becomes 5 feet tall in the wild and sports leaves like those on banana trees. Grow it in full sun to partial shade in rich soil. It's one of the plants that like acidic soil. The unique flowers of Himalayan poppies (Meconopsis grandis) dazzle with blue umbrellas that shelter fuzzy, yellow centers. The plants stand 24 to 36 inches tall; the sky-blue flowers measure 4 to 5 inches across. Grow them in zones 5 to 7 in dappled shade and in ​ground that drains well but that you can keep evenly moist. They want a little bit of moisture around their roots all of the time but not too much at any time. They want summers that aren't too hot but winters that aren't too cold. Orange crown imperial (Fritillaria imperialis Rubra) is a spring bulb plant that stands 3 to 4 feet tall. The flowers stink, but don't hold that against them: They are the most unique and most beautiful of the spring bulb flowers. Multiple orange, bell-shaped blooms form the "crown" atop the plant stalk. Adding further uniqueness are the six shiny, circular, bright-white dots underneath each nodding flower. Suited to zones 5 to 8, crown imperial should be placed in full sun and well-drained soil. Secret Lust (Echinacea Secret Lust) belies its common name of "coneflower." Rather than displaying a cone at the flower's center, it sports a puffy "hairdo." Gardeners who pay attention to detail will also notice that the flower changes color twice during its course of development. The plant grows about 3 feet tall. Secret Lust is listed for zones 3 to 8. Grow it in full sun and well-drained soil. Northern pitcher plants (Sarracenia purpurea subsp. purpurea) are carnivores native to cold climates. They are fun plants to grow because you'll be fascinated by the way the flower starts out as a tight ball, then unfurls as it develops. The namesake "pitchers" are modified leaves that will also charm gardeners. Other genera have even more unique pitchers, such as tropical pitcher plants (Nepenthes), which produce pitchers that look like the powder horns carried by American pioneers. Northern pitcher plants grow to be 20 inches tall. Grown in zones 3 to 7, they like full sun and lots of water. The unique "flower" of another carnivorous plant, sundew (Drosera), is a faux flower. Insects are tricked into thinking it's a real flower by the namesake dewdrops that glisten on its tiny stalks: They look like drops of nectar to unsuspecting insects. But when the insects land on them, they become trapped because these drops are quite sticky. You, too may be tricked into thinking they're flowers, so exquisite is their beauty. But, unlike with insects, the illusion will cause you no harm. Sundew comes in many species. D. intermedia can be grown in just about any zone. Since they like boggy conditions, they're good plants for wet areas. Red hot poker plants (Kniphofia) are so called because of their cylindrical shape and the "hot" color of their flower spikes. Many types have bicolored flowers. The species plant, Kniphofia uvaria, is another South African native; it can reach 4 feet high. However, cultivars like Pineapple Popsicle (yellow), Mango Popsicle (orange), and Redhot Popsicle (red) stay shorter (2 feet). Grow these unique flowers in zones 6 to 9 in full sun and well-drained soil. Native to Sumatra and Indonesia, titan arum (Amorphophallus titanum) grows from a corm. It bears the world's largest flower (10 feet tall). It takes so many years to bloom that it's truly news when it does. Just don't take "flower" too literally: The actual flowers, which are foul-smelling, hide at the bottom of the hooded plant part known as a "spathe." A showy spike (the "spadix") pokes up through the spathe. Taken together, spathe, spadix, and flowers make up an "inflorescence." So, technically, titan arum has the largest inflorescence on earth. The related devil's tongue (Amorphophallus konjac) doesn't get as big, but you'll enjoy its inflorescence annually. Because Amorphophallus is tropical, it's hardy only in zones 8 to 10; Northerners need to dig the corm up in fall and bring it indoors. Grow it in dappled sunshine during the summer. The soil should drain well but be kept moist. Silk trees (Albizia julibrissin) look tropical, but these Asian natives are actually suited to zones 6 to 9. Their height reaches 20 to 35 feet and the delicate, silk-like flowers are fragrant. As a bonus, the fern-shaped foliage is pleasantly dark on some types, such as Merlot Majik. They're invasive in some regions of the U.S., so check with your county extension before planting. Grow them in full sun to partial shade. Amethyst in Snow (Centaurea montana Amethyst in Snow) and Amethyst Dream (C. montana Amethyst Dream) both give you a perennial bachelor button with bicolored flowers, but the contrast of the two colors shows up better on the former because one of the colors is light, while the other is dark. Amethyst in Snow is also better suited for use as a ground cover to fill in an area because it does spread. Otherwise, the two perennials are the same. Centaurea montana grows to be 20 inches tall x 27 inches wide. Grow the plants in full sun and well-drained soil in zones 3 to 9. The Iris genus contains some of the toughest, prettiest, and most fragrant flowers in the plant world. If they had nothing else going for them, then this triad of qualities, alone, would make them unique flowers. But Batik bearded iris (Iris germanica Batik) sweetens the deal further by offering bicolored flowers. The plant grows 2 to 3 feet tall. Grow Batik iris in zones 3 to 8. It likes full sun and dislikes a soil that gets overly wet. Perfect Storm hibiscus (or "rose mallow") is part of the Summerific series. It's a hybrid cultivar of Hibiscus moscheutos, which is known as the "hardy hibiscus" to distinguish it from its better known tropical cousins. This perennial becomes 3 feet tall. The size of the bicolored flower is an impressive 7 or 8 inches across. ​The dark foliage is striking enough for it to be treated as a foliage plant when it isn't in bloom. Grow Perfect Storm hibiscus in zones 5 to 9. 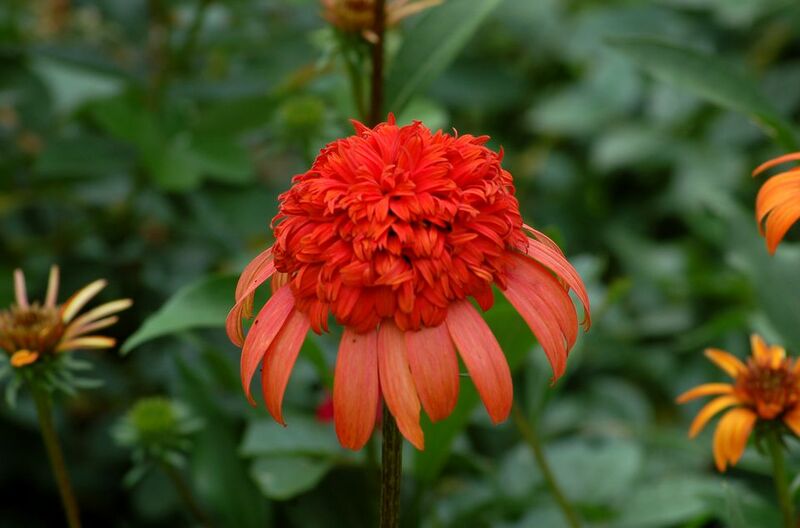 It likes full sun and a well-drained, evenly moist soil. Nora Leigh phlox (Phlox paniculata Nora Leigh) not only has variegated leaves but also bicolored flowers (an unusual combination). Since one color on both the leaves and the flowers is bright, this perennial really shows up. It reaches a height of 24 to 36 inches. The tall types of phlox, such as Nora Leigh, are great for achieving continuous sequence of bloom because they're perennials that will bloom all summer. Nora Leigh is hardy to zone 4 and can be grown successfully as far south as zone 8. Install it in full sun to partial sun. It has average water needs and will profit from annual applications of compost. Featherleaf Rodger's flower (Rodgersia pinnata Elegans) is one of the best plants most people have never heard of. It offers irregularly-shaped plumes of flowers reaching as much as 18 inches long. Just as unique as the flower cluster is the foliage: It gives you a perennial with leaves looking ever so much like those on horsechestnut trees (Aesculus). It's also a big enough plant (3 to 4 feet tall) that it will make a statement in the landscape. This is a great perennial for shade that is useful at the edge of a water garden, where it's easier to give it the ample water it needs. Another Goldilocks (like Himalayan poppy), zones 5 to 7 are just about right for it: It likes cool summers but not terribly cold winters.